Steven (Chicagoland, United States) on 18 October 2011 in Cityscape & Urban and Portfolio. Aerial view looking north from the John Hancock Observatory, Chicago, Illinois. John Hancock Observatory is complete with full 360-degree views of the city, up to four states and over 80 miles. 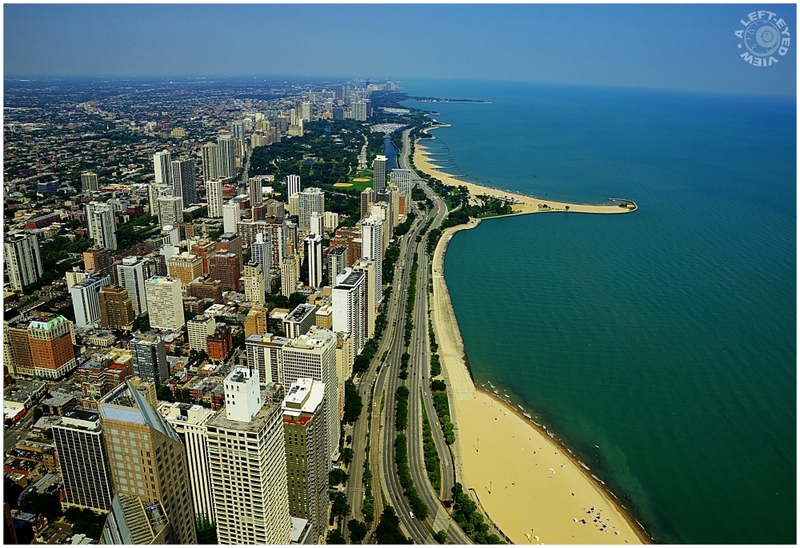 To the right is Lake Michigan and the major north-south road seen below is Lake Shore Drive. North Avenue Beach is the beach that reaches eastward out into Lake Michigan. Oak Street Beach is pictured at the bottom. Photo captured August 31, 2011.
wow Steven! at frist sight I though you show us a shot from Miami. it's really an amazing beach view and so well captured. An amazing, clear view - beautiful! wow.. what an amazing view..
an amazing cityscape view taken from above, Great capture ! When viewing this it is so difficult to imagine why Chicago gained a reputation as "the windy city"! I'd love you to return and shoot the same view during the worst of the winter storms. Simply breath taking - and beautiful clarity! Awesome view, Steven, and so educational to those who may not equate Chicago with glorious beaches. I have been there just once, to play a gig, and loved the city with a vow to return for a good soak in its vibrant architecture-music-food-neighborhoods. A lot of people also don't know about "the windy city" being a nod to the braggadocio of locals in the old days, and not about the actual winds. Anyway, super cool shot. Wow, what an amazing place to visit this would be - this view is spectacular Steven! I had no idea that Chicago was so close to Lake Michigan, guess that's why Chicago's known for being so windy. Fantastic shot! wow an impressive overview of this shore! fantastic! Beautiful, Stephen...Such a tall building that is! Is that Racine I see way up there?? Beautiful view and composition! A fantastic panoramic shot. Great job and congratulation for being there. 5*****!!! Wow! This is beautiful. At first I did not think this was Chicago. Amazing! more amazing. A beautiful view of the beach, moreso that it is not Miami. A fabulous shot from such a wonderful vantage point. Very beautiful. it's one beautiful view from up there for sure! well, this is one hell of a view! thanks for the link !!! Oh gee, that is absolutely stunning, I've never ever seen Chicago look this striking with beaches and beauty oozing out right out of it. *****Brilliant !